Nope. Stop right there. It’s easy to see social media as this “shiny new thing” that’s going to answer all your company’s prayers and drive the lead generation you’re looking for, making you want to dive right in and get started… But do you understand what your B2B organization actually needs to do or how to do it? 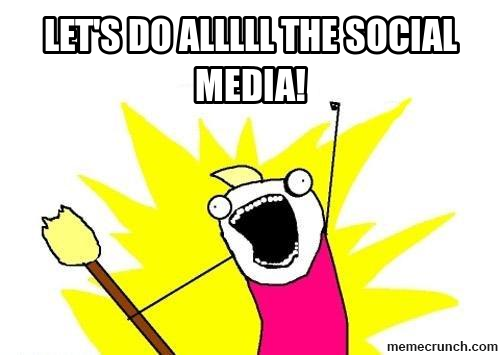 1) Social media for B2B is unique. The overall intent for all B2B campaigns is to nurture prospects, collect user interest and attribute data, and then reapply that data to shorten the sales cycle. A typical, single-shot, B2C campaign often comes to mind when any organization first gets started on social media – but that idea needs to be pushed out of your head. A B2B campaign must be a continuum of ongoing engagements that give your prospects time to see the value in what you’re publishing and warm up to your solution. In the B2B space, it’s important to remember that the buy action comes much later, and is much less transactional, than in the B2C world. As our CEO likes to say, “Social media is the largest cocktail party in the world. You wouldn’t walk into a big networking event and say, ‘Here’s a 15% off coupon for our ARP software.’ Would you?” We’re dealing with a longer, more complex sales cycle, so the “give” needs to be your content that educates the user. By providing relevant and valuable content around the clock, you earn your prospects trust, while gathering valuable data at the same time that will allow you to tailor future content to guide them down the sales funnel and update your CRM so your sales team can follow-up outside the campaign. 2) You should only be where your buyers are. It’s easy to get excited and want to create an account for every social media network under the sun, or hop on the bandwagon of whatever fun new network everyone’s talking about – but that’s more than likely a terrible idea, unless you’re trying to find ways to waste your own time. Just because it’s new and everyone’s talking about it, doesn’t mean it’s for you. Oh, Pinterest is the latest craze, you say? Who cares? If you can’t answer that question with “my buyer personas care,” then you would be wasting your time by creating and using a Pinterest account for your company. Personally, I actually really, really love Pinterest (slightly addicted to recreating recipe and craft ideas I find on there) but I would be terrible at my job if I thought that my personal interest in Pinterest (see what I did there) justified implementing it into my social media strategy. 3) You should research and strategize just as much for your social media game plan as you would for any other aspect of your business plan, and the same thing goes for monitoring your progress and analyzing results. Don’t just dive in – do your research and come up with a strategy. Put it in writing, make it part of your organization’s marketing plan, and don’t just put some intern or self-proclaimed “social media guru” in charge -- or you’re asking for a huge disaster (I wrote a whole post about this terrifyingly common mistake, please check it out before you do anything else involving social media). Regardless of the research you find most informative, or the strategy you come up with, I urge you to pay more attention to your own results than you do to whatever the “latest research findings and best practices that you MUST implement right away!” While there is definitely a lot of great data that you should consider, everyone’s results will still be different – because everyone’s buyer personas are different, meaning they will respond to and interact differently than everyone else’s. If you’ve been posting for a while, and you have access to the analytics of your social media efforts, do yourself a favor and take a look at your data. For example, if your tweets with the most clicks just so happen to be the ones that go out around 2:00pm, then you’ve found your answer for what time you should make sure you’re posting on twitter, since, clearly, your target audience is responding best at that time. If you’re starting from scratch, don’t have access to data from past efforts, or are unhappy with the results (or lack thereof) that your data shows, don’t worry: In the last post of this series, I’ll be providing a template you can use to follow and implement your social media strategy, which will show you how to alter it week by week to gain a variety of data and insight. You can then track your results right in the same template to discover what works best for you, and then build your official strategy based on your findings. Get excited – your results will probably surprise you, so documenting your results every day will feel like a little treat. 4) Each social media outlet is different and your implementation strategy can’t be the same across the board for all of them – however, it’s very important to make sure they’re all aligned with the same overall goal. What/when/how/why you post on Twitter shouldn’t be the same as what/when/how/why you post on LinkedIn (this goes for all social media networks). There’s a good chance some of your buyer personas will be present on one network, but not the other. This means that the way you interact, and the reasoning behind why you post the time and way that you do, should also be different, but the overall goals you’re looking to accomplish by taking the time to post and interact should be the same. This goes hand-in-hand with everything I explained in #3 on this list. The success of your efforts all really comes down to developing a rock-solid strategy, and taking the time to understand each network -- by understanding which of your buyer personas are active on which ones. Understanding this will help you figure out the appropriate messaging for each network, and the tracking and analyzing I discussed in #3 will help you figure out the best implementation strategy for each network. 5) Your efforts on each individual outlet need to compliment each other and make it easy for others to realize that you’re there. Regardless of the differences between each social media network, you need to make accessibility to each of them the same across all of your assets. You should have links to your social media profiles at the top of every page on your website -- other than your landing pages, you should have your social sharing module towards the bottom of those, in your email signatures, on your foreheads (just kidding). In your company description/information on one social media network, you shouldn’t just link back to your website and blog, you should also provide links to your profiles on every other network. When you do something new or cool on one network, use the others to promote that and share the news. Reach 1,000 followers on Twitter? Use Facebook and LinkedIn to let everyone know. Have all your employees share the news about your new company page with all of their LinkedIn connections, etc. There is almost endless potential for increasing your exposure. Almost even more important -- if you don’t include social sharing buttons with ALL of your content, you’re doing yourself a huge disservice. Make it easy for others to share your content, so that they can do the promoting right along with you. Social proof is a very valuable asset to the success of your content. 6) Social media execution doesn’t need to be a difficult, time-consuming process, but it DOES need to be a priority and a commitment. Once you start posting, it looks terrible if you suddenly stop. Consistency is key. If someone finds your company Twitter profile and notices that you used to post throughout the day, every day, but suddenly stopped and haven’t produced a single tweet in months, they’re going to wonder what’s going on -- regardless of the reason behind it, it’s going to seem fishy and make you look unstable as a company. Another gem of a quote my CEO said to me one time (probably without realizing I would later quote him in a post about it) that really hit the nail on the head: “The biggest risk of social media is that while it can be a very important part of your strategy, it’s never urgent.” – What he means by this lies in the fact that while you might understand, and even have data to prove, the value in your social media strategy, it’s very easy to push it off and move it to tomorrow on your to-do list. I personally struggle with this from time to time, since it wouldn’t be the end of the world if I didn’t write a few social media posts on any given day, even though I want to, and know that I should. How can I take care of that problem? Writing and scheduling in advance so that I never let it get to that point in the first place… which brings me to the last item on our list. 7) Consider your options for automation. Throughout the rest of the posts in this series, I’m going to be sharing screenshots to show you exactly how we post, how we analyze the performance of our posts, and some examples of both posts of ours that have been successful and ones that have been unsuccessful. You’ll see that we use Hubspot, one of the many options that exist for social media marketing automation. I personally really like their social media tool (and pretty much everything else about their platform, to be honest). Full disclosure: we’re a Hubspot Gold Partner, and you can read our post about why we decided to partner with them here. There are tons of options out there, but by using a tool that allows you to post in advance, you give yourself the opportunity to write posts in bulk when it’s convenient for you and then schedule them to go out based on whatever posting strategy you’re following. Without this feature, it makes it very difficult to post at different times throughout the day, every day, and from different networks. You’re much more likely to fall behind and end up ditching your schedule, which also means you’re ruining the consistent nature of your data and your analytics won’t be as strong. I’ll be writing another post during this series about all the features of Hubspot’s social media tool and how they benefit us, along with all of the ways that they allow us to tie our social media efforts into the rest of our business strategy. Check back next week for the second post in our B2B social media series!